Also known as a Slantboard. See also the foam wedge under Blocks and Benches. 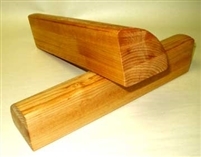 Please note: Some wood items have slight imperfections that do not affect their use. 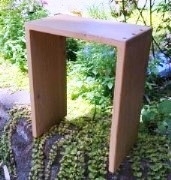 Useful for blocking the foot in standing yoga poses with, or without, the tresler. Also useful to give more height in Utthita Maricyasana. Measurements: 10" long and 3 1/2" radius Please note: Some wood items have slight imperfections that do not affect their use. Knee wedge. This prop was designed to fit into the back of the knee for poses such as virasana. Since then many more uses have been discovered. Sarvangasana can be transformed with the use of this prop. You will also see it used to wedge the sides of the pelvis and buttocks in various poses such as savasana and supta padangusthasana. Finished with a clear hard oil coating which gives a very durable natural light coloured finish and protects the wood. The 15" quarterround can be used in the same way as the standard, shorter quarterround. Some students like the extra length for practicing various back arching yoga poses on the floor, or over a chair. Often used in pairs. Please note: Some wood items have slight imperfections that do not affect their use. 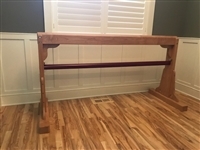 Constructed of strong hardwood maple. Italian for "little round thing". A mini-backbender. 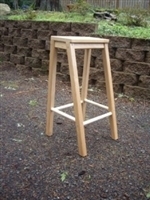 Can be used in pairs in place of a headstander stool. PLEASE NOTE : Delivery Time is approximately 4 weeks .Thank you for your patience. 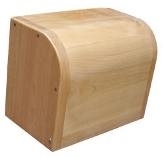 18 1/2 L", 11 3/4 W", 7 3/4" H.
Also known as a Setu Bandha Bench Extension Box. 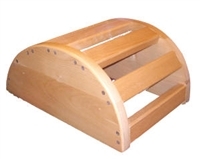 Can be turned on 3 sides or used in pairs for a variety of asanas. PLEASE NOTE : Delivery Time is approximately 4 weeks .Thank you for your patience. Also known as a halasana bench. Used primarily for supported halasana. 18 inches wide. 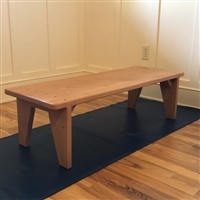 The price of this yoga bench includes shipping.Additional shipping charges outside of the 48 contiguous states. PLEASE NOTE : Delivery Time is approximately 4 weeks .Thank you for your patience. 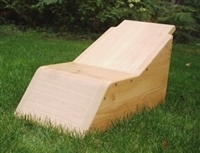 The price of this yoga bench includes shipping. (for the contiguous 48 states). ***proprietory info: approx measurements 12" h x 15" x 42". PLEASE NOTE : Delivery Time is approximately 4 weeks .